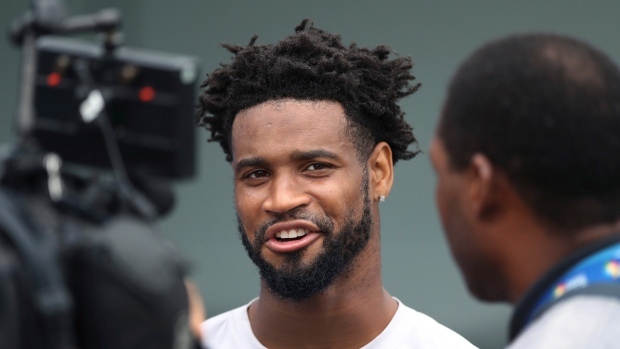 ALLEN PARK, Mich. — Darius Slay lost his footing in coverage and landed on the grass. He limped off the field, trying to keep weight off his right leg. "No," Slay insisted. "It wasn't nothing at all." After sitting out briefly, Slay eased his way back into slower-paced drills. He was later running full speed to keep up with Detroit's wide receivers such as Golden Tate and Marvin Jones. "They're true competitors," Slay said. "I work with them every day and I enjoy working with them. We're just trying to strive to get better." Slay and the receivers take turns making plays throughout practice. One moment, Slay's blanketing coverage is enough to prevent a completion. Another time, Matthew Stafford might thread a pass past him and into the hands of a well-covered receiver. "With Darius, you know you have to bring it every single play," Tate said. "He's very fast. He's very quick, and his knowledge of the game grows every day. "When we go across from each other, our goal is to embarrass each other." Slay emerged as one of the NFL's top cover cornerbacks last season and earned All-Pro honours. The Lions did not have many dependable cornerbacks in recent decades, but that changed with at least one key player five years ago. And, they've paid him well to keep him around. Slay is in the second season of a $50 million, four-year contract. "It's just a natural thing," he said. "You either got it or you don't."